MELVINDALE, Mich., May 5, 2016 — Evans Distribution Systems, a family-owned and operated logistics company with an impressive 87-year history and strong commitment to the economic growth of Detroit, is launching the Detroit Fulfillment Initiative (DeFI). 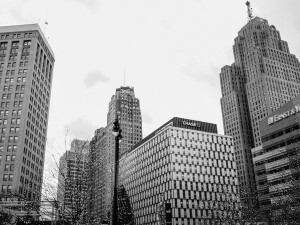 DeFI will help provide product-based businesses in Detroit with the necessary tools, services and connections to launch and increase their market share. The initiative intends to accelerate the growth of Detroit by providing strategic opportunities to business owners that are looking to start or grow their product based business. Working with partners to offer resources ranging from office space, financial counseling, marketing services and risk management, to insurance, supply chain and technology acquisition, DeFI’s goal is to provide companies with all the necessary services and tools needed to meet their fulfillment demands. For information about DeFI, please visit www.detroitfulfillment.com. Evans Distribution Systems, headquartered in southeast Michigan, was founded in 1929 as the Central Detroit Warehouse Company. It has evolved into a full-service, third-party logistics provider offering warehousing, transportation, contract packaging, fulfillment and staffing to the manufacturing, food and beverage, consumer goods and chemical industries. Evans currently employs more than 700 associates and operates over two million square feet of space in Michigan and across the U.S. Find more information on our website, www.evansdist.com. Read the latest supply chain insights at Evans’ blog, or follow the company on Facebook and Twitter.